The U.S. advertising marketplace began 2019 on a down note, with the major agency holding companies reporting a 3% decline in January vs. the same month in 2018, according to a UBS analysis of ad-spending data compiled by Standard Media Index. UBS attributed the weak 2019 start to a couple of shifts in major TV event programming -- the shift of two NCAA football semifinal games and the Grammy Awards telecast -- out of January 2019, making for tougher comparisons with a January 2018 that included them. That said, it appears to be the first January to begin on a downbeat since SMI began tracking the U.S. ad marketplace, and follows 12 consecutive months -- and five consecutive quarters -- of expansion, according to the UBS analysis. According to the U.S. 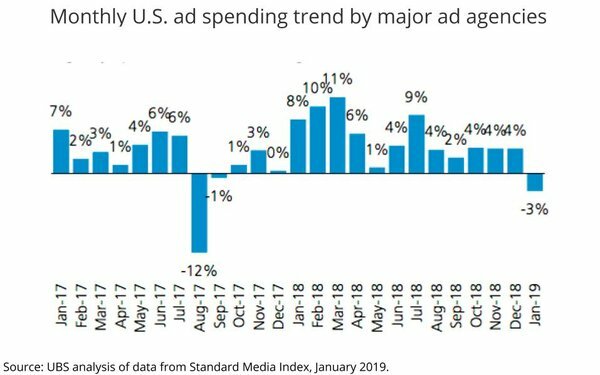 Ad Marketer Tracker, a collaboration of SMI and MediaPost, there has never been a decline in January ad spending since the index began in January 2011. UBS' analysis indicates it is likely all attributable to a weak TV ad-spending month, with TV ad volume declining 7% versus January 2018. By comparison, UBS found that "pure play" digital media sources gained 9% in January versus the same month in 2018.